Welcome to the worlds greatest guide to Women's Linen Pants. 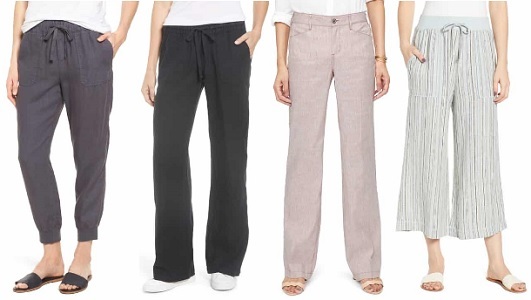 Are you actually looking for Women's Linen Pants? Well, we hope you are because the reality is that you have found our Women's Linen Pants page. Apparel Search is a leading guide to fashion, style, clothing, glam and all things relevant to apparel. 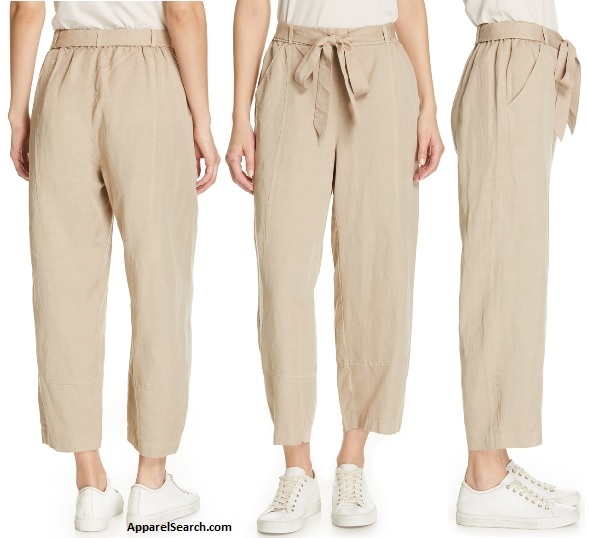 We hope that you find this Women's Linen Pants page to be helpful. Simply put, linen is cloth woven from flax. clothing worn on the lower half of the body often from the waist to the ankles and covers both legs separately. Pant don't have to reach all the way to the ankles, but they do have to cover both legs separately. If they don't cover the legs separately you might actually be wearing a dress or skirt. Women's linen trousers are pants made from linen fabric. Linen is laborious to manufacture, but the fiber is very strong, absorbent and dries faster than cotton. Garments made of linen are valued for their exceptional coolness and freshness in hot and humid weather. Linen fabric feels cool to touch, a phenomenon which indicates its higher conductivity (the same principle that makes metals feel "cold"). It is smooth, making the finished fabric lint-free, and gets softer the more it is washed. However, constant creasing in the same place in sharp folds will tend to break the linen threads. This wear can show up in collars, hems, and any area that is iron creased during laundering. Women's linen pants have poor elasticity so the fabric does not spring back readily, explaining why it wrinkles so easily. What are the little bumps on linen? They are the slubs. A characteristic often associated with linen yarn is the presence of slubs, or small, soft, irregular lumps, which occur randomly along its length. In the past, slubs were traditionally considered to be defects, and were associated with low quality linen. However, in the case of many present-day linen fabrics, particularly in the decorative furnishing industry, slubs are considered as part of the aesthetic appeal of an expensive natural product. Linen pants can be 100% linen or they can be blended with other fibers. If you want to be even more stylish, you should wear your Women's Linen Pants. Learn about various pant styles.